Have you ever considered why the act of forgiveness is so difficult? Eighty-three percent of Americans polled shared forgiveness eluded them even with meditation and prayer. Inclusion may be foreign concept to many and forgiveness the known when people seek healing, and change but a deeper exploration is required to understand why this is so. The Inclusion Solution© workshop offers an embodied awareness of the limits forgiveness and reveals Inclusion’s natural alignment with the unified field that seeks to unite what has been separate. If you are on a path of conscience growth and evolution moving into a new paradigm of unity Inclusion is the practice that paves the way to the peace and oneness you seek. ​Through thousands of Systemic Constellations dealing with life's most difficult issues, Systemic Family Constellation trainer Krista Jarrard has observed that the traditional act of forgiveness causes an energetic imbalance and does not offer a lasting inner peace.
" 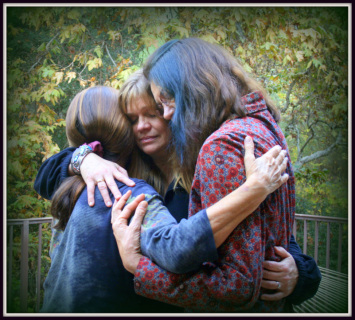 When we look at the definition of forgiveness, "to give up the desire or power to punish." it is no surprise to see how ones attempts at this may fail. With this we come to the stunning discovery; the act of traditional forgiveness engages one in the same energetic field that created the act that needs to be forgiven in the first place. This insight has been extraordinary, as if discovering the missing piece to the puzzle in journey to oneness. I am excited to share the secrets of these exciting discoveries in a new format, Constellation Workshop, simple, profound and highly accessible. Through this experiential weekend, participants receive an embodied awareness of the limits of traditional forgiveness and the expansiveness of reconciliation, and inclusion. This new awareness is huge shift in perception, and becomes a profound support in one's life and practice." Krista Jarrard, Center for Systemic Healing. Discover the Surprising Truths Hidden in Plain Sight. Cultivate your understanding for what allows Constellation Work to bring resolution to life's most difficult issues. Understand and Feel how the traditional act of forgiveness causes a charged energetic imbalance. Experience the expansiveness of inclusion and the victim/perpetrator field of traditional forgiveness. Learn Inclusion as a Resolution Practice. Receive a New Embodied Awareness to develop Ongoing Support. In my practice, it is common for a client to assure me they have "released" and therefore "forgiven" their relationship with whomever, or to whatever, only to quickly discover that is not the case. The practice of releasing and letting go of something, sounds like such a good idea, but rarely does it provide enduring solutions and an end to repetitive dynamics. In my experience until we integrate, and include all aspects of an issue, the releasing is just another form of exclusion; and exclusion is the basis of most ALL of our issues. If we stop to think, where exactly does it go when it is "released"? The it is usually something that has an energetic or emotional charge, and until we transform the charge, it will pop up over and over again. Maybe not in the same way, but some way or somewhere, IT WILL resurface. Trying to control or get rid of every uncomfortable thought, feeling and issue can be exhausting and unproductive. Cutting off, or pushing something down or away only produces more pressure. This is NOT what personal or spiritual growth is about. In a Constellation we can literally see it. Energy has to go somewhere, and the beauty of the Constellation circle is that it shows right before our eyes. It becomes visible. Whatever the attribute or issue is, someone will start to hold and express it. We find that solutions and healing movements come from including what presents itself. Inclusion is what the issue requires, to be seen, acknowledged, and given a place. It is the act of Inclusion that discharges the energy and transforms the issue. So if releasing is an illusion, what about forgiveness? I have given this much consideration in recent years and observed that it carries a hidden dynamic, which makes it elusive, and apparently a dilemma for a huge segment of the population. Eighty-three percent of Americans polled shared forgiveness eluded them even with meditation and prayer. 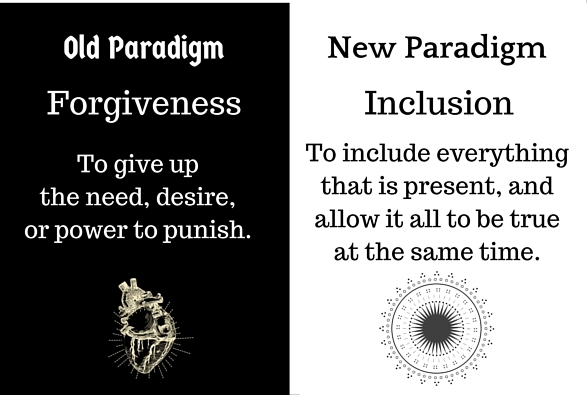 I delved deep into this forgiveness dilemma and discovered something remarkable; there is a hidden dynamic to traditional forgiveness practices, it actually creates an energetic imbalance. It is this powerful and compelling dynamic that keeps us stuck in the cycle of repetition and hostage to the old paradigm of victim perpetrator. When we look at the definition of forgiveness; "to give up the desire or power to punish" it is no surprise to see how ones attempt at this may fail. With this we discover one is still engaged in the same energetic field that created the issue that needs to be forgiven in the first place. We know we cannot create a new outcome or healing solution from this charged space. Because of this the Constellation process does not operate within these boundaries, and limitations. We BEGIN in the inclusive unifying field of the Constellation Circle. Who Should Attend? Anyone that has ever struggled resolution and forgiveness, and desires a new embodied awareness of ongoing support that will allow a greater quality of life for themselves, their family and the world should attend this special event. Especially those in the creative, healing, and therapeutic arts. What participants are saying about the Inclusion Solution workshop. "Profound day in beautiful company- with amazing embodied insights about reconciliation - thank you! “Thank you Krista, you have come up with a true solution to "The Forgiveness Dilemma." I highly recommend that everyone having difficulties in life take this workshop!" Contact Krista at 760-745-3435 for latest details.